When you put your home on the market it becomes a product. In order to compete in the market place your home must be priced right and look better than the competition. Staging® is the process of preparing any home to sell for the highest possible price and in the shortest amount of time. Staging® can be applied to any home regardless of size, condition, location or market. This can be a simple process, from removing clutter and rearranging furniture to completely redecorating and refurnishing all the rooms in the home. 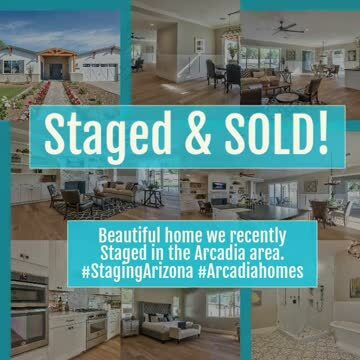 Your Investment in Home Staging by Staging Arizona is very affordable considering the benefits: more showings, a higher selling price (usually 5-12% more than other non-staged homes) and a quicker sale (2-3 times faster)! Staging Arizona- Premier Home Staging Company specializing in Staging and Redesign services for homes in the Phoenix Metro Area. We offer affordable home staging services for homes for sale in Mesa, Gilbert, Chandler, Tempe, Scottsdale, Ahwatukee, Ocotillo, Queen Creek, Gold Canyon and other Surrounding Cities within the Phoenix Area. Our team of Certified and Accredited Home Stagers are excited to go to work for you and are passionate about home staging. Our mission is to add value by enhancing your homes appeal and therefore improving your homes equity. We have Staged homes all over the Valley and take pride in our work. View our Photo Gallery to see examples or visit the Staging Videos section to see the transformation of each home. Keep in mind each project is tailored to that Clients budget and not all budgets are the same. We offer affordable solutions for every budget and have many happy Clients....read some our of Testimonials. "Your company, Staging Arizona, provided me with prompt, effective, professional service at an affordable price. I was impressed with the amazing transformation you were able to accomplish in such a short time. I have no doubt that your staging contributed greatly to the quick sale of my house and want to personally thank you for such a great experience. If you have questions or would like to get started Contact Us today. We offer FREE Online Quotes and we are happy to help you in any way we can. We appreciate you visiting our site and feel free in the meantime to visit our FAQ's section for commonly asked questions about Staging your Arizona home. Staging Arizona attended the 2017 RESA Convention!! We gladly accept these credit cards.